– in addition to coaches, at least three rifle handlers are required. – a job preference, if you have one. The first biathlon event of the Vancouver Winter Olympic Games offered up two suprising medalists. Slovakia’s Anastazia Kuzmina, ranked just 28th in the World Cup Standings, set an early pace of 19:55.6 and overcame a penalty to earn the Gold Medal in the women’s 7.5km sprint. Kuzmina becomes the first Slovakia to win a Gold medal at the Winter Olympic Games. Germany’s Magdalena Neuner earned the Silver medal with a time 19:57.1 and France’s Marie Dorin won the Bronze with a time of 20:06.5. While Neuner was a top medal contender, neither Kuzmina nor Dorin were expected to land on the podium. A number of the world’s top female biathletes, such as Helena Jonsson of Sweden and Andrea Henkel and Kati Wilhem of Germany, struggled as weather slowed the course. Megan Tandy was the top Canadian, finishing in 46th position. By placing in the top 60, Tandy has qualified for Tuesday’s 10km pursuit. Canadian teammates Zina Kocher (65th), Rosanna Crawford (72nd) and Megan Imrie (76th) failed to qualify for the 10km pursuit. Megan Imrie is ‘our’ Olympian, so we encourage you to watch her on television during the Olympics. Megan’s CTV TV athlete profile can be found here. Watch for more posts on Canada’s biathletes and we encourage you to share what you know! This is the time when all eyes around the world are on winter sports and a time for Biathlon to shine. Falcon Lake Combined Event a Success! January 16th and 17th was a busy weekend on the trails and range at Falcon Lake. Saturday was a CCSAM sponsored XC ski race which brought out nearly 100 competitors. Despite the lack of snow, the races were a success! 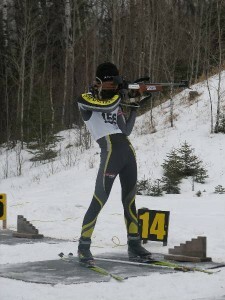 In the afternoon, racers were invited to the Biathlon range to try their skills under the supervision of a BAM athlete. The open house was very well attended.